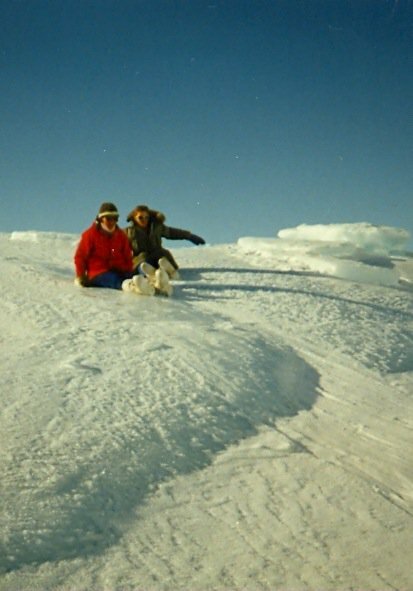 Back in the late 1980s and early 1990s my husband and I lived and taught in Pond Inlet, Nunavut (it was still Northwest Territories then). and found out how little I knew about teaching. 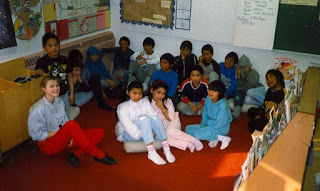 My five years (twenty-five years ago) on Baffin Island qualifies me (I guess) to be the Nunavut contributor for Reading With Miss D's party Booking Across Canada. 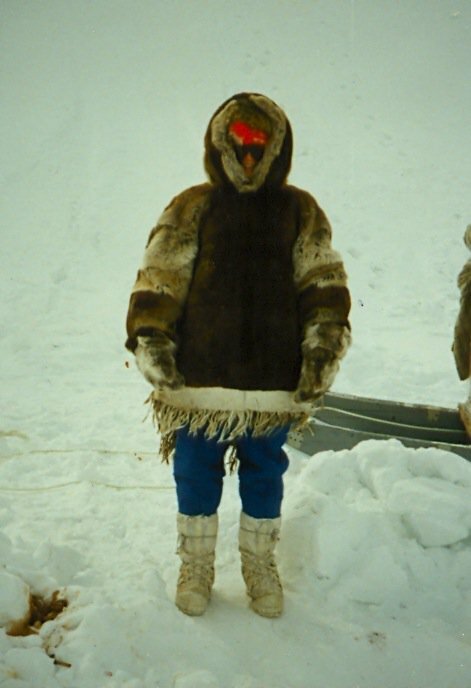 I chose a book, written by a teacher who taught in a neighbouring Arctic community while we were in the Arctic. On a November afternoon, Leah's mother went visiting, leaving little Leah and her father to look after each other. Leah's father told Leah not to go outside - there were polar bears nearby... Snow covered the land. Ice covered the bay. The sun was starting to go down. The moon was coming up. Out on the ice in the middle of the bay, a huge iceberg stood. who went outside to discover the world. Rereading Out on the Ice in the Middle of the Bay, I instantly go back to my Arctic days when I would "go visiting" (stopping by to visit with someone, walk in the door, no knocking, drink very strong tea with sugar), when the iceberg was a busy place in the spring time for "tea parties" (coleman stoves and tin mugs, not china and napkins) and when the roar of a snowmobile was normal. Reminiscing aside - the story has a lovely balance-counterbalance in the stories of the dad and little Leah, and the polar bear and her cub. We understand the love that each has for their child, and want the chance meeting of child and cub at the iceberg to end well for everyone. Alice Priestly's pencil drawings are perfect for creating the Northern atmosphere. 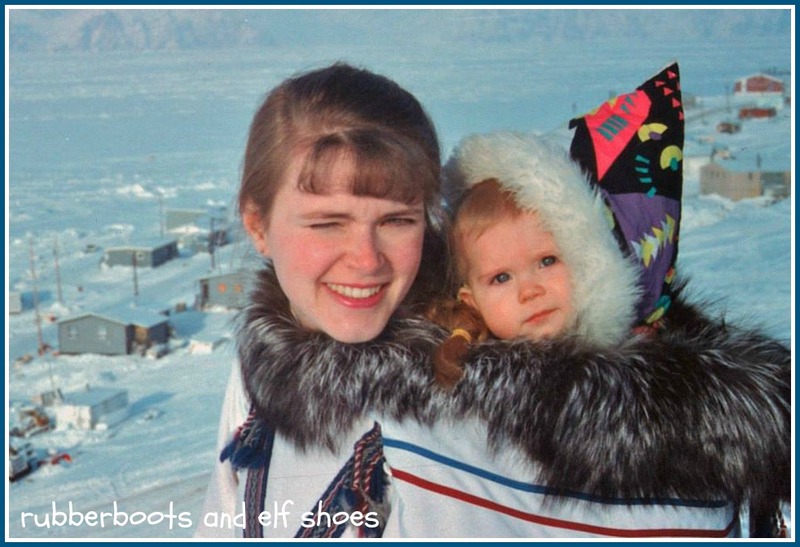 The human details are realistic - I saw many little girls look just like Leah in their Mother Hubbard parka, mitten strings included. 1. Enjoy the trailer for the book. Blogger and YouTube do not seem to want to co-operate to post the video, so, please, click the link. It's a beautiful trailer. 2. Work with a lesson plan. 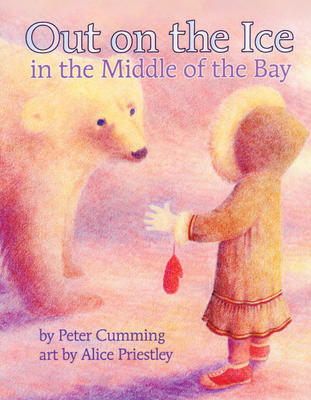 Canadian Teacher Magazine featured a visualization lesson plan for Out on the Ice in the Middle of the Bay. 3. Learn about polar bears. Kids National Geographic has their usual high quality, interest piquing multi-media information. World Wildlife Organization presents information about these fascinating creatures. That Artist Woman did this polar bear art project with a grade one class. Stunning. Little Leah wears a Mother Hubbard parka. (So did I - except when I went out on the land or was carrying my daughter). 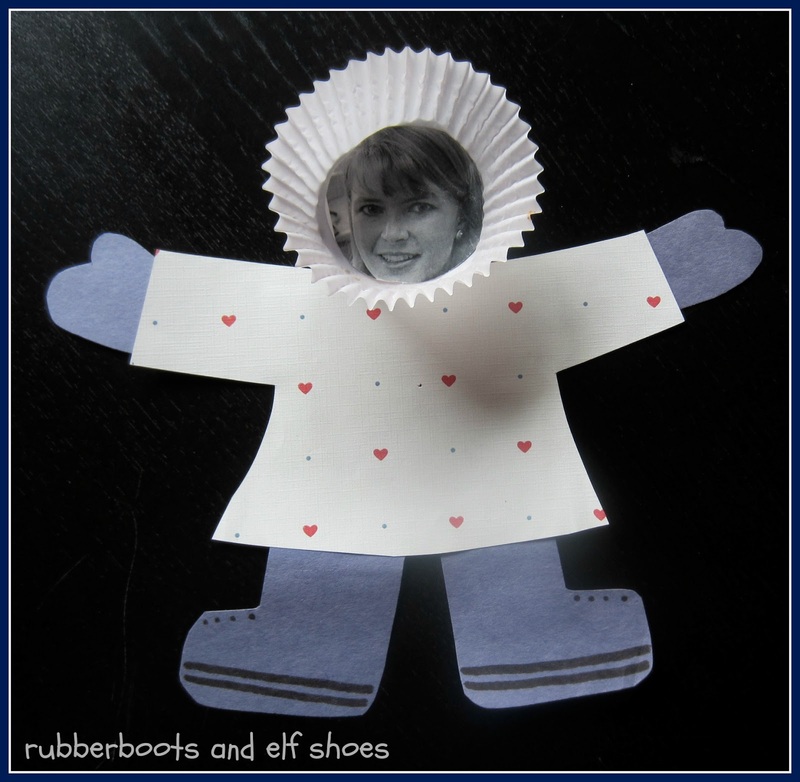 Make a parka child with a body tracer and a parka made out of wallpaper samples or scrapbook paper, and a cupcake paper for the hood. 7. 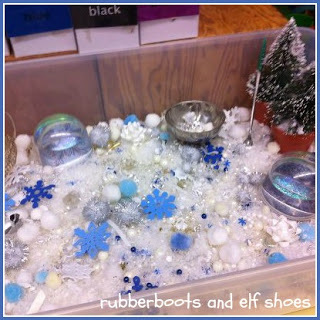 Enjoy some sensory play. 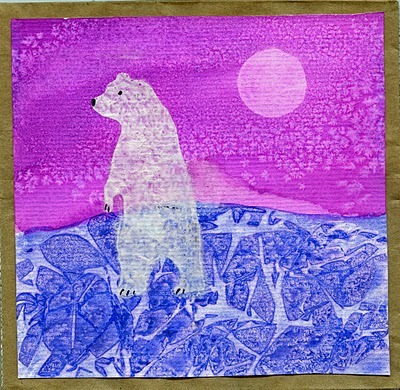 Make a winter bin and add some polar bears and other arctic animals. Please, keep the penguins for the antarctic bin! Click on the graphic to go to the post. 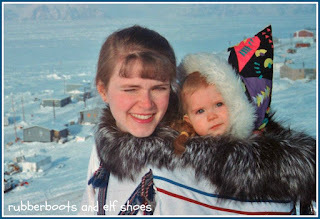 I am going to leave you with a picture that my husband took of me and our daughter just before we left Pond Inlet to move to balmy Vancouver Island. We are helping the baby in the amautii move into a new house today. I miss the time when my amautii hood was full. This looks like a fabulous book, too. I'm very drawn to books featuring our northern regions and the indigenous people. Excellent choice! It's a lovely read-aloud Barb. If you like Northern books, you'll love this one. This looks like a great book. I really enjoyed your pictures as well. 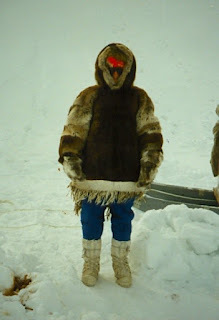 It reminds me a bit of when I was really little and my Dad was stationed in Churchill. My Mom tells stories of what it was like living up there. Thanks for sharing. Sounds like you are a Northern Girl! I loved learning about this time in your life. You are one of the most interesting people I have ever known. I love how you always remind me to hold my babies closer. Thank you for sharing. It's nice of you to think that I am interesting - my kids think I am as dull as dish water!! 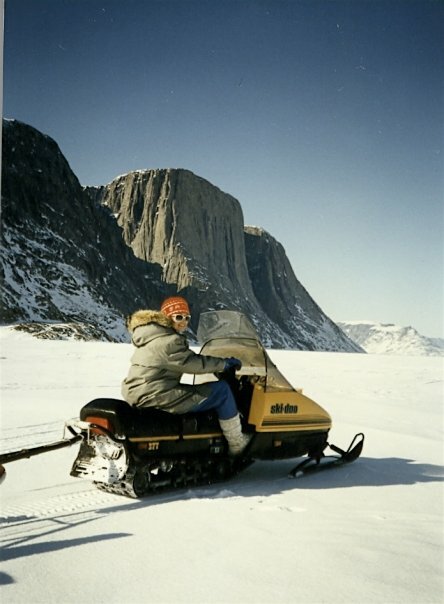 The Inuktitut word for grieving means "my hood is empty". Hold your babies close before they use those wings you worked so hard to give them, and fly away. Thinking about you and your new job and new house. Great book Sandi - thanks. I wore a different kind hood at that time, but I too, still miss the baby in my hood. I just moved her out of rez and up to Ottawa for the summer so she could start her new job. Thanks for sharing, your posts always make me smile. This looks wonderful, Sandi! It reminds me just a little of Blueberries For Sal :) How neat that you lived in the Arctic - a special connection to this book :) Love your activities! I will have to reread Blueberries for Sal. It's been a while.